For a limited time when you purchase the darling little labels from Mabel's Labels, you can get $25 in "Mabel Moolah" for every $80 spent! Place an order of at least $80 before taxes and shipping before September 15, 2009 to get this deal! 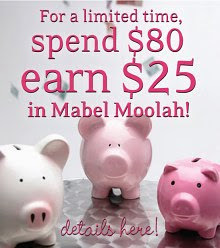 Your Mabel Moolah can be redeemed between November 3 - 25, 2009, on orders totalling at least $50. Visit the Mabel's Labels website for more details. They still have their fabulous Ultimate Back-to-School Combo Pack - 98 personalised pieces - for $39! Works out to about 40 cents a label. And shipping is FREE in Canada, $3 to ship to the US. 0 Response to "Spend $80, Earn $25 in Mabel Moolah"